What is the best up-to-date naming practice – if you want cross platform functionality, one big family, without style linking (which nowadays is obsolete anyway, right?) Thank you. I wouldn't say style linking is obsolete. People are going to click those big B and I buttons wherever they are offered, or use the keyboard shortcuts and menu commands. One current practice is to restrict regular/bold style linking to the regular and bold weights, and not pair up other weights (for example light and semibold or thin and extrabold) as used to be common practice. The idea is that regular and bold are the only pair that you can expect people to guess that the shortcuts would work for. Pairing a roman of any weight with its italic is still a good idea. Thanks Georg. One more question: in style linking – if I don’t have a regular style, is it ok to have say the medium as regular instead, for style linking to work? And if so, do I need to assign regular weight (400) to the medium, or can it still be 500? As far as I know you can style link any weight to any weight regardless of weight value. I think Windows doesn't like that, and has complex and idiosyncratic dependencies when interpreting the family structure, which can result in fonts not showing up in the font folder and/or menus. It's not something I do with my families, but there I remember there are Adobe families that map Light to SemiBold or something similar. They will appear under their short family name in the font menu on Windows and work with the I and B buttons. 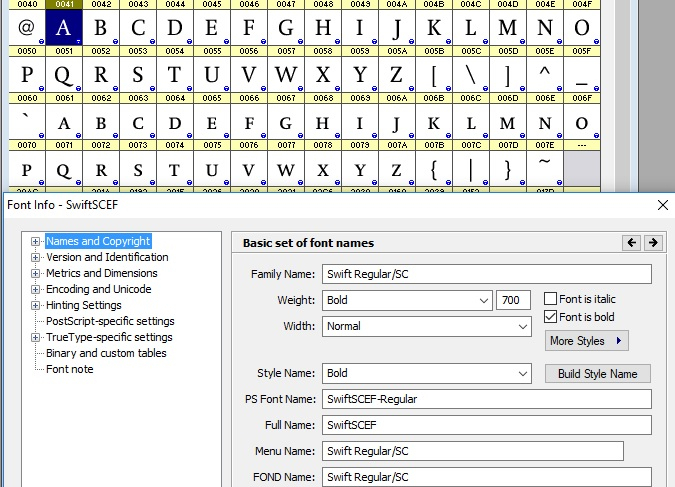 Check the font menu in PowerPoint in Windows if you monkey with the linking. It's fussy about the existence of Regular. This (Elsner&Flake) version of Swift is still working in Windows 10 / Word. The Small Caps was the BoldItalic version of the regular. Not recommended anymore, except for styles called Regular and Bold.